The Balkan mountain range (Bulgarian and , Stara planina, "Old Mountain") is a mountain range in the eastern part of the Balkan Peninsula. The Balkan range runs 560 km from the Vrashka Chuka Peak on the border between Bulgaria and eastern Serbia eastward through central Bulgaria to Cape Emine on the Black Sea. The highest peaks of the Stara planina are in central Bulgaria. The highest peak is Botev (2,376 m), located in the Central Balkan National Park (established 1991). The mountain gives the name of the Balkan Peninsula. 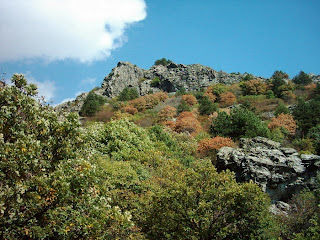 Stara Planina played an enormous role in the History of Bulgaria and the development of the Bulgarian nation and people. In earlier times the mountains were known as the Haemus Mons. Scholars consider that Haemus (Greek 'Aimos) is derived from an unattested Thracian word *saimon, meaning 'mountain range'. Other names used to refer to the mountains in different time periods include Aemon, Haemimons, Hem, Emus, the Slavonic Matorni gori, the Turkish Kodzhabalkan and Balkan. The term "balkan" however, is Persian in its origin, brought into southeastern Europe by the Turkic peoples from Central Asia. The term stands for 'rolling hills' (from Persian, Barkhwan/Barkhan/Balkhan). In places like Turkmenistan and the eastern shores of the Caspian Sea one still encounters this name, such as the Balkan Peninsula and the Balkan Province in Turkmenistan. Stara Planina is remarkable for its flora and fauna. Edelweiss grows there in the region of Kozyata stena. Some of the most striking landscapes are included in the Central Balkan National Park with steep cliffs, the highest waterfalls in the Balkan peninsula and lush vegetation. There are a number of important nature reserves such as Chuprene, Kozyata stena and others. Most of Europe's large mammals inhabit the area including the brown bear, wolf, boar, chamois, deer. In geological term Stara Planina is a young mountain. It is part of the Alp-Himalayan chain which stretches across most of Europe and Asia. It can be divided into two parts: the main Balkan Chain and the Pre-Balkan which follows the main chain to the north. To the north the Pre-Balkan slightly goes into the Danubian Plain, while to the south the mountain borders with the Sub-Balkan valleys - a row of 11 valleys running from the border with Serbia to the west to the Black Sea to the east which separate the Balkan mountains from a chain of other mountains known as Srednogorie which include Vitosha and Sredna Gora. Western Stara Planina from Vrashka Chuka at the border with Serbia to the Pass of Arabakonak with a total length of 190 km and highest peak Midzhur (2,169 m). Central Stara Planina from Arabakonak to the Vratnik Pass with a length of 207 km. 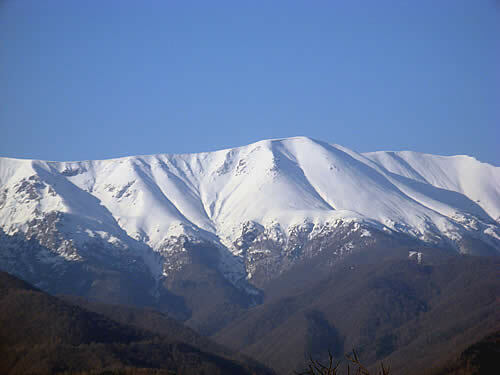 Botev Peak (2,376 m) which is the highest in the range is located in that section. Eastern Stara Planina from the Vratnik Pass to Cape Emine with a length of 160 km and highest peak Balgarka (1181 m). Eastern Stara Planina forms the lowest part of the range. Stara Planina forms a water divide between the rivers flowing to the Danube in the north and those flowing to the Aegean Sea in the south. However, it is crossed by Bulgaria's widest river, the Iskar, which forms the spectacular Iskar Gorge. Rivers which take their source from Stara Planina and flow northwards to the Danube include Timok, Archar, Lom, Tsibritsa, Ogosta, Skat, Vit, Osam, Yantra, Rusenski Lom. It is also the source of the Kamchia which directly flows in the Black Sea. Although not so abundant in mineral waters as other parts of Bulgaria, there are several spas such as Varshets, Shipkovo and Voneshta Voda. 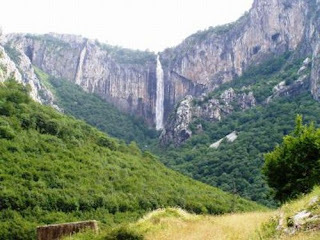 There are a number of waterfalls, especially in the western and central parts of the range such as Raysko Praskalo which is the highest waterfall in the Balkan Peninsula, Borov Kamak, Babsko Praskalo, Etropole Waterfall, Karlovsko Praskalo, Skaklya and others. Botev Peak 2376 m (7,795 ft), named after Hristo Botev. Midzhur 2169 m (7,116 ft), the highest peak in Serbia and north-western Bulgaria, 12th in the Balkan Mountains. Stara Planina has a significant and special place in the history of Bulgaria since its foundation in 681. It was a natural fortress of the Bulgarian Empire for centuries and formed an effective barrier to Moesia where most of the Medieval capitals were located. The Balkan mountains were the site of numerous battles between the Bulgarian and the Byzantine Empires including the Battle of the Rishki Pass (759), Battle of the Varbitsa Pass (811), Battle of Tryavna (1190) and many others. In the battle of the Varbitsa Pass Khan Krum decisively defeated an enormous Byzantine army killing Emperor Nikephoros I. For many centuries the Byzantines feared that mountain and on several occasions Byzantine armies had pulled back only on the news of approaching Stara Planina. During the Ottoman rule many haiduks found refuge in Stara Planina. Close to the highest summit, the Botev Peak, is Kalofer, the birth place of Hristo Botev, a Bulgarian poet and national hero who died in the Western Stara Planina near Vratsa in 1876 in the struggle against the Ottoman Empire. Also close to Botev peak is the Shipka Pass, the scene of the four battles in Russo-Turkish War, 1877-78 which ended Turkish rule in the Balkans. Close to the pass in the village of Shipka there is a Russian Orthodox church, built to commemorate Russian and Bulgarian bravery during pass defense.